Sarah Lesko (left) and James Dunchuck, both of Salem-Republic Rubber Co., at Salem's hospitality night party. As the saying goes, everybody loves a party, and the rubber industry is no different. But to my observations over the years, this is no more true than at the Manufacturers Hospitality Suites that are a big part of NAHAD's annual conventions. For these gatherings, two well-known terms apply: "Size matters," and "It's all about location, location, location." 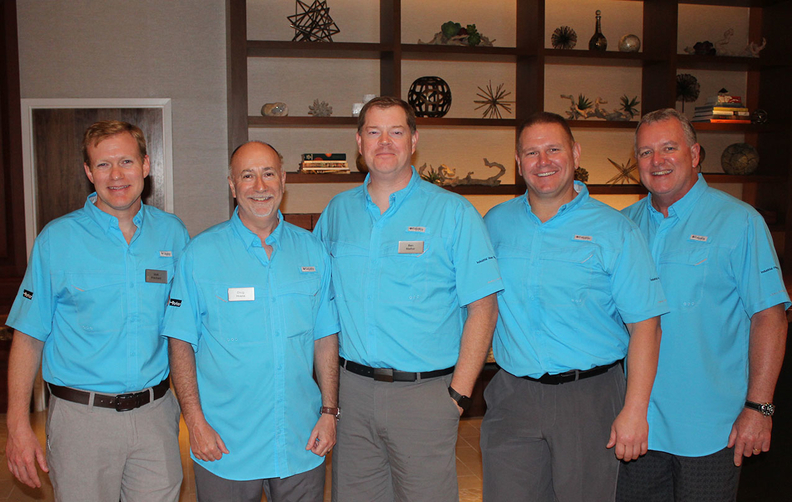 And when NAHAD held its recent meeting in Marco Island, Fla., the beach settings gave the makers of hose, couplings and other accessories plenty of room to be creative with their events. ContiTech's Andreas Gerstenberger and Guy Enta headlined the firm's launch of a new cloud-based crimping technology during its NAHAD Manufacturer Hospitality Night event. Continental's ContiTech business unit definitely went with the "size matters," approach. It was using its event to launch its new cloud-based CrimpIQ technology, and spread the word that at 8 p.m. that night, they were going to reveal a the big secret. The teaser method of spreading the word seemed to work, as ContiTech drew a large crowd for the launch. But you don't have to be one of the large players of the industry to draw a crowd. Salem-Republic Rubber Co. teamed up with Anco International for its party, which was right as you exited onto the back area of the Marriott hotel overlooking the ocean. The location was perfect, and their party had a steady flow of people going through it. Teaming up like those two companies did is a common approach for some of the smaller players to get the needed exposure without having to shell out the big bucks some of the larger players do. Home Rubber and Hi-Tech Duravent joined with about a half-dozen other firms—each of which had a small exhibit area—to throw one of more well-attended events of the evening, not to mention the one that had my favorite dessert. 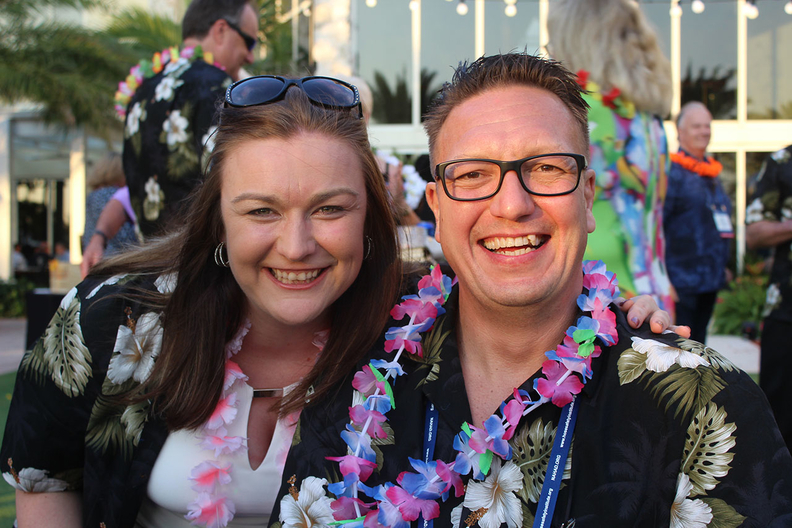 The management team for Parker-Hannifin's hose business held its hospitality party at the hotel restaurant that was located right on the beach, making for a relaxed evening. But the major players also made sure their customers were taken care of. Gates had a large pool-side event with a racing theme, while Eaton hosted its party on one of the large hotel balcony areas, and threw in ongoing entertainment to boot. Parker-Hannifin definitely went with the "location" approach, renting out the Quinn's on the Beach restaurant of the Marriott. The low-key gathering had an excellent selection of food, games on the beach, and areas just to sit out on the beach and relax with nice conversation. With total attendance of more than 1,000—split fairly evenly among manufacturers and distributors—the NAHAD convention has a busy schedule of business and networking events. But Hospitality Night remains one of the "don't miss" nights of the meeting. Bruce Meyer is editor of Rubber & Plastics News, and he sees potential rubber-related stories nearly everywhere he goes. Follow him on Twitter @bmeyerRPN.